Announcement A wonderfully warm welcome to all Monkarocks Etsy customers. Here at MoNkARoCkS we specialise in aLTeRNaTiVe custom-made t-shirts, shirts and accessories. We have your obsessions well and truly sewn up. MoNkARoCkS is uniquely alternative and stands alone in design and quality. wear it out . . .
A wonderfully warm welcome to all Monkarocks Etsy customers. Love,love,love this amazing custom t Shirt. Rachel and Phil at MoNkARoCkS are amazing. Their help,advice and workmanship is beyond fantastic. New design. 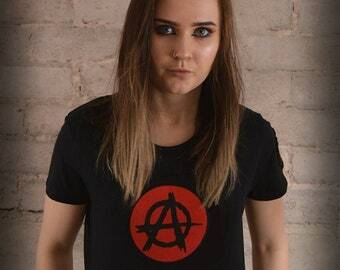 Tartan rebel anarchy punk alternative tee. Worn by lead singer Voicex. Photo by Deborah Mullen. Unique Custom made Heavy Drapes punk shirt. We make many of these through our other shops! Contact us if you’re interested! Celtic knot with stunning Buchanan tartan. Front patch and sleeve designs with customised label. MoNkA is a small family-run cottage industry which began life in 2015. With 25 plus years experience in graphic design, live music and lookin' cool, Monka has a lot to bring to the party. Fed up with two dimensional tee shirts with boring old on-fabric print and disillusioned by poor quality tee shirts MoNkA decided that enough was enough and set out to design and create tee-shirts of outstanding design and quality that would proudly bear the MoNkA label. Radical design features merge with vibrant colours and erupt into iconic images in a whirlwind of wonderful compositions which will turn heads, hearts and souls. 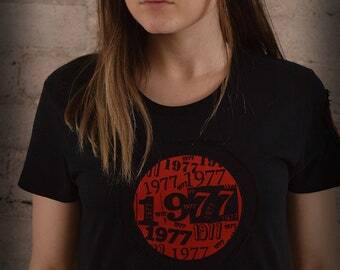 These fantastic quality tee shirts provide complete comfort and furnish a truly luxurious feel. Frayed layers of tantalising tartan and vibrant velvet patches merge magnificently into a multi-textured triumph of sensory delight. Handcrafted in the Highlands of Scotland these deluxe tee shirt designs incorporate portrayals of anarchy set against the sheer defiance of tartan and revolutionary design features all in a blistering representation of the Spirit of Rebellion! Music fans, collectors of memorabilia and notable musicians can be included in Monka's customer list. ". . . thanks for those fantastic shirts, the quality is absolutely amazing. I think you're doing a wonderful job and anyone who gets to hold one of your shirts in their hands and wear one will soon find out that the photos only tell a small part of the story. The technique you use to do the designs is beautiful, you've played a blinder mate and I hope more people get to own one and see for themselves how a t-shirt can actually be a work of art. Respect." To view more music celebrities head on over to our Pinterest page and check them out!!! To view our massive selection of designs go to our official website.